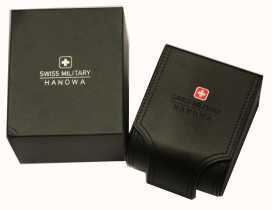 Authorised retailer for Swiss Military Hanowa Watches. Free delivery, 30 day free returns and five-star rated service. Buy now with up to 12 months 0% finance. Swiss Military Hanowa are a high quality watch manufacturer who are officially licensed by the Swiss Confederation. Swiss Military Hanowa watches have built up a fantastic reputation for producing high quality Swiss-made watches at a very competitive price. Hanowa were founded in 1963 by Hans Noll, with his wife Elizabeth Noll-Wirz. Hans Noll was originally a sales manager for another watch firm before he founded his own watch company. The name of the brand was derived by taking the first 2 letters from the words Hans Noll Watches. By 1966 the brand had already built up a fantastic reputation for producing great quality watches. The Swiss Military brand was developed in 1990 as a brand that focused on high precision sports, performance and lifestyle watches. The 50th anniversary of the company took place in 2013, today Swiss Military Hanowa watches are available in over 72 countries around the world! Swiss Military Hanowa watches are proudly Made in Switzerland and put together with the highest quality materials. All Hanowa watches are made using only Swiss made quartz or mechanical movements from top manufacturers in Switzerland. Swiss Military Hanowa watches come with luminescent hands and/or hour markers as standard. The Superluminova material ensures that all Swiss Military Hanowa watches are perfectly visible, even at night! Swiss Military Hanowa watches are made from different materials, but the meterials used are of exceptional quality. The watch casing and metal bracelets are made from 316 L high-grade steel, which means that the watches have a premium feel and are incredibly durable. The majority of the range are water resistant and are made from sapphire crystal which is one of the most durable substances available. The Swiss Military Hanowa Men's Crusador is one great example of the durability of the Swiss Military Hanowa watch range.